Founder, Artistic Director, and Violinist of the New World Trio, Anhared Stowe has spent a lifetime in music as a teacher, a Hartford Symphony Orchestra section leader, and a soloist. As a performer and recitalist, Ms. Stowe has recorded works on the Opus One Label, as well as non-classical music on other labels in the UK. She has also performed as soloist with orchestras up and down the east coast and midwest. More recently, Ms. Stowe was heard on NPR’s Morning Edition, accompanying the poet Edgar Silex with works of her own composition. She earned her Bachelor of Music degree at the Juilliard School, and her Master of Music degree under the tutelage of Charles Treger at The Hartt School. Ms. Stowe has worked with members of the Juilliard, Hungarian, and Guarneri String Quartets, the Beaux Arts and Albaneri Trios, as well as Janos Starker, Arthur Balsam, and Joseph Fuchs. Cellist Peter Zay’s musical achievements have taken him to concert halls throughout the United States, Europe, and Central America. He appears regularly on the Sunday Serenades Concert Series at the Wadsworth Athenaeum in Hartford, CT., and has traveled frequently to Spain to perform as a guest of the Quartetto Saravasti. As a member of the American Sinfonietta, he has toured to many of Europe’s leading venues, including Vienna’s Musikverein, Frankfurt’s Alte Oper, and Stuttgart’s Beethoven Saal. He has performed at the International Musical Arts Institute chamber music concerts in Fryeburg, Maine, the Yellow Barn Chamber Music Festival (VT), the Taos Chamber Music Festival, the Aspen Music Festival, and the Bellingham (WA) and Wintergreen (VA) Festivals of Music. He has been featured live on WFCR and WAMC Public Radio and has been heard on radio broadcasts across the United States and Europe. 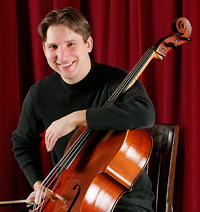 In addition to being a member of the Hartford Symphony Orchestra, Peter is principal cellist of the Plymouth Philharmonic. He has performed with the Boston Lyric Opera, the Pro Arte Chamber Orchestra of Boston, the Boston Modern Orchestra, the New World Symphony, the Barrington Stage Company and the New Haven, Springfield (MA) and Portland (ME) Symphonies. As a backing musician, he has toured with Diana Krall, Linda Ronstadt, Pepe Romero and Andrea Bocelli, and he has appeared with Luciano Pavarotti, Barry Manilow, Peter Gabriel, Arlo Guthrie, Frankie Valli, the Beach Boys, Aretha Franklin, and many others. As a member of the Mosaic String Trio, Peter has collaborated to create and perform many varied and engaging educational programs to thousands of school children throughout Connecticut. He is also a member of the New Bedford (MA) Symphony’s SchoolsMusic! Trio, which has performed hundreds of concerts for children in the south coast area of Massachusetts, and he is a featured soloist in the NBSO Symphony Tails program. Described as a pianist of "searing precision" by her hometown newspaper the Hartford Courant, Pi-Hsun Shih enjoys a versatile career as a soloist, collaborative pianist, and teacher. The Taiwanese-American musician has been a featured soloist with the Sao Paulo State Symphony, The Hartt Symphony, and the Mexico State Symphony Orchestra, for whom she served as the principal keyboardist. She has performed throughout North America, South America, and Asia with ensembles such as Empire Brass and the Emerson String Quartet. Ms. Shih has been a participant in a number of diverse chamber ensembles. Early in her career, she performed in the clarinet-piano ensemble Duo Asiatica, whose self-titled album was chosen as Record of the Month by Shanghai's Xinmin newspaper. In a review of the recording, the International Clarinet Magazine praised Ms. Shih for a “passionate virtuosity,” that supported, not supplanted, the soloist. A sensitive collaborator, Ms. Shih later was invited to join the New World Trio, with whom she has performed for over a decade. She has also concertized with her sister Yu-Chen Shih, as Duo Asiana, a piano duet that recently won Second Prize at the International Chamber Music Ensemble Competition in Boston. Her experience with those ensembles has allowed her to build on the strong grounding in classical repertoire she received at The Hartt School (D.M.A.) and Boston University (M.M. ), and develop a musical style characterized by the Hartford Courant as full of "agile ease and brilliant flashes of panache." Ms. Shih's recent collaborations have focused on promoting contemporary compositions. She has premiered works by Shih-Hui Chen, David Macbride, Dan Román, Robert Edward Smith, Kurt Stallman, Ken Steen, and Gwyneth Walker. She regularly performs with Russian-American cellist/composer Tanya Anisimova as Duo Bona Fide. She has formed Kelet Duo to promote new music from East Asia and Eastern Europe. The New World Trio commissioned me to compose Harp of Canaan in memory of Sally Williams, a good friend of the NWT. Sally had a remarkably diverse and extensive education that included degrees in the arts, education, and religion. Her professional career was also diverse, but I was inspired particularly by her work as a hospital chaplain and decided to orient my piece toward Sally’s spiritual life. Harp of Canaan is based on an old tune called North Port, one of many short works that make up a unique American repertoire of communal Christian choral music know as Sacred Harp or shape-note singing. Sacred Harp singing originated in New England and is still practiced by groups of mostly amateur singers who come together to sing for themselves and to praise God. The refrain of North Port includes the words: “I want a seat in Paradise, Glory Hallelujah! I love that union never dies, Glory Hallelujah!” The old tune provides the melodic and harmonic fabric of my piece which begins with a single instrumental voice and gradually adds three more. After a rousing four-voice version of North Port comes a series of variations which develop different aspects of the tune but maintain the harmonic language and ardent character of the original. The title of the piece refers to Sacred Harp music and to that part of the Holy Land from which Canaan, Connecticut took its name. I want the music to express transcendent joy, the joy that Sally surely felt in her work supporting the arts and ministering to people in need.